A high proportion of the bowling greens I see every year are victims of what has become accepted as “conventional maintenance”. I say victims, because much of what has come to be accepted as normal in bowling green maintenance, is anything but, if you happen to be a grass plant or a healthy living soil. Below you will find a very popular article that was published on this site a while back, which illustrates very clearly the dangers inherent in “going with the flow” or following the herd to put it another way! The diagram above shows the process that many poorly maintained bowling greens experience over a period of years if 3 basic maintenance issues are not addressed as a priority. 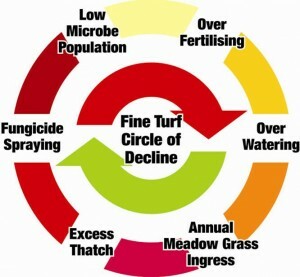 In addition to the top 3 there are of course other important issues such as irrigation management, topdressing etc, but if these 3 big issues are under-managed then the green will spiral into what we have called the Circle of Decline. Simply put this is the devastating course of events that go on largely un-noticed by many bowling clubs until it is too late to effect a quick recovery. Grass relies on beneficial fungi to make best use of the available nutrition and so begins to have difficulty obtaining the necessary nutrition from the soil. In my new book, Performance Bowling Greens, I will be detailing a more measured and calm approach to bowling green maintenance based on scientific fact, a deep understanding of nature and the interaction between turfgrass and soil. An approach, in fact a full program you can follow to ensure that your green performs to a very high standard at a reasonable cost. We’ll be back tomorrow with more news.